This two-year enrichment plan doesn't have anything to do with grades and may not get you credits toward graduation, but it will help you get the most out of your undergraduate experience here at UCSC and set you up for the next steps. Are you ready to go the extra mile? Download this .pdf or stop by the department office (361 Soc Sci 1) for your own print version. 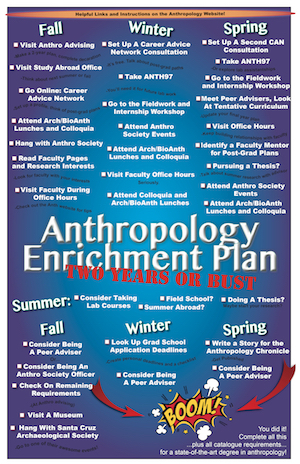 Visit Anthro Advising to make a two-year course plan and complete major declaration. Go to Study Abroad Office and explore programs for summer or next Fall. Set up profile on Career Advice Network and begin looking at post-grad career paths. Attend Arch/Bio Lunches and Anthropology Colloquia. Read faculty profiles and research interests. Identify faculty that have research interests that are complementary to your interests. Visit faculty members during office hours. Introduce yourself, explain your research interests and ask for suggestions for pursuing research further. See how to talk to faculty for suggestions on building working relationships. Set up a free consultation on Career Advice Network. Discuss post-grad career paths and steps needed to get there. Take ANTH 97 to explore future lab work opportunities. Attend the fieldwork and internship workshop. Set up a second free consultation on Career Advice Network. Discuss post-grad career paths and steps needed to get there. Review next year’s Tentative Anthropology Curriculum and meet with peer advisers for an updated final year plan. Visit faculty members during office hours. Introduce yourself, explain your research interests and ask for suggestions for pursuing research further. See how to talk to faculty for suggestions on building working relationships with faculty (link to How to talk to faculty – relationship building). Identify a faculty mentor to help you make post-grad plans. If pursuing a thesis, secure thesis adviser and explore options for research during summer. Consider taking lab courses during summer. Consider a field school during summer. If pursuing a thesis, consider beginning research outside of classes. Consider applying to be an anthropology peer adviser. Consider serving as officer in Anthropology Society. Check your remaining major requirements with Anthropology Advising Office. Attend an event by the Santa Cruz Archaeological Society. Look up sample Grad School Application Timelines and develop a personal deadline. Consider writing up a story for the Anthropology Chronicle.